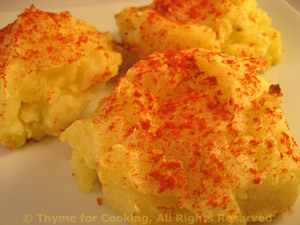 Mashed Potato Puffs, with a hidden cheesy surprise, Thyme for Cooking. Individual mashed potato puffs with a surprise inside. The original reason was to keep the potatoes piping hot while we had the first course. The cheese was.... just because! Peel potatoes and cut into large chunks. Put potatoes in medium saucepan and add just enough water to cover. Add salt and cover. Bring to a boil over medium heat. When boiling (and pay attention or they will boil over) reduce heat and take cover partially off. Continue cooking until done, 15 - 20 minutes. They should be very done, easily coming apart when poked with a fork. Mash potatoes with a potato masher (or fork if you don't have one) Add butter and enough of the milk to get a fluffy consistency. Butter four circles on a baking sheet. Divide the potatoes in half. Dividing one half in 4ths, spoon a mound into the center of each buttered circle. Make an indentation in the center. Put a piece of cheese in the center, add the remaining potato, evenly divided, completely enclosing the cheese. Bake, 350F (170C) for 15 minutes, until just lightly browned.